We're not so sure why either. Still cool though. The Land Rover Discovery Sport is the brand’s best-selling model. A total of 75,000 customers have taken delivery of one so far in 2017 alone. Impressive. But for some reason, Land Rover felt it necessary to pit its best-seller against a champion Finnish dog sled team to prove its snow and ice handling bona fides. Because of a warm Northern European summer, the only place where snow could be found was a man-made underground tunnel called the Vesileppis Sky Tunnel. The SUV’s competition was Finnish middle distance champion Laura Kaarianen and her six huskies. Turns out Kaarianen and crew are pretty good at what they do, being champions and all. But they could still use some additional training. It does make for an interesting race and the final result is surprisingly very close. Horsepower vs. dog power. Had to say it. Anyway, Land Rover specifically wanted to highlight two things: One, the fact that an estimated 50 percent of Land Rover customers are dog owners and regularly travel with them. 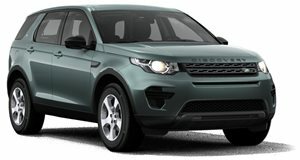 And two, the Discovery Sport’s intelligent all-wheel drive technology, Terrain Response system and 285 hp gasoline engine. The SUV was not driven by a pro, but by Jaguar Land Rover’s Lead Engineer for Stability Control Systems, Karl Richards. So check out this friendly machine vs. animal competition because, well, sled racing dogs are pretty cool.